Our last January issue of 1974 covered the NASL's college draft. The No. 1 pick won the NASL title his rookie year while his UCLA teammate opted for the NFL. 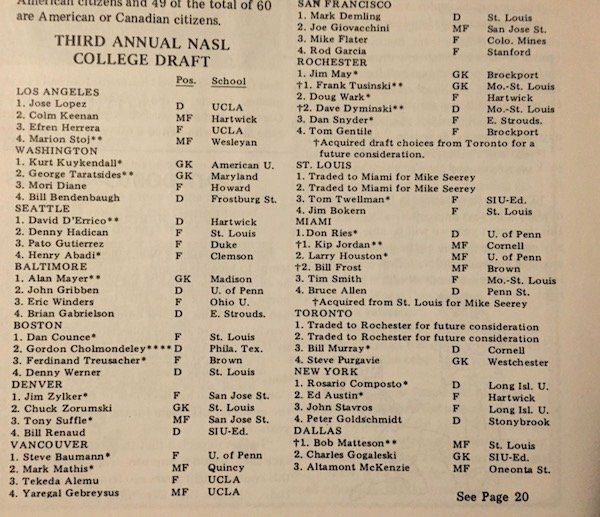 NASL Commissioner Phil Woosnam and Administrative Assistant Ted Howard oversaw the draft in which a third of the picks hailed from the St. Louis area. The Los Angeles Aztec's No. 3 pick was UCLA's Efren Herrera, who opted for a career as an NFL placekicker, which would include a Super Bowl title with the Dallas Cowboys. No. 1 pick Jose Lopez out of UCLA helped the Los Angeles Aztecs win the 1974 NASL title, appearing in 10 regular-season games and in the semifinal and final wins over Boston and Miami. Lopez currenlty serves as an assistant coach UCLA, whose Frankie Amaya was the No. 1 pick in the 2019 MLS SuperDraft. Goalkeeper Alan Mayer out of James Madison went on to play for the USA and logged 184 NASL games. 1 comment about "In Soccer America 45 years ago: St. Louis and UCLA products in high demand". Craig Cummings, February 1, 2019 at 8 p.m.
W S what has happened in St. Louis area, as S L used to be the hot bed of USA soccer when I was growing up. I know you have JOSH but?